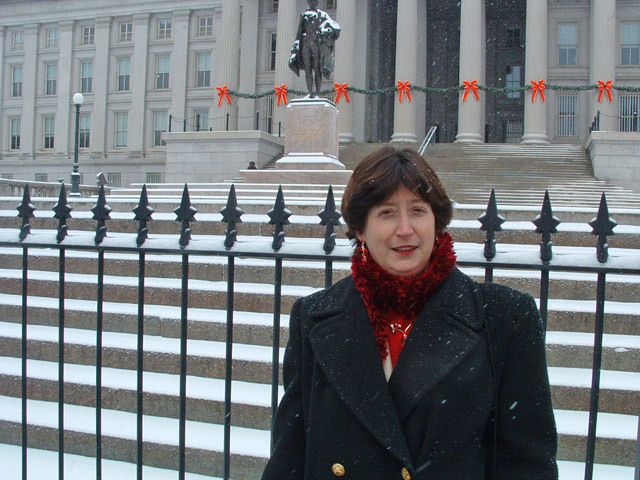 For the second consecutive year, Eye on Washington's President Janet Kopenhaver was honored to receive an invitation to the White House holiday party during the 2010 season. 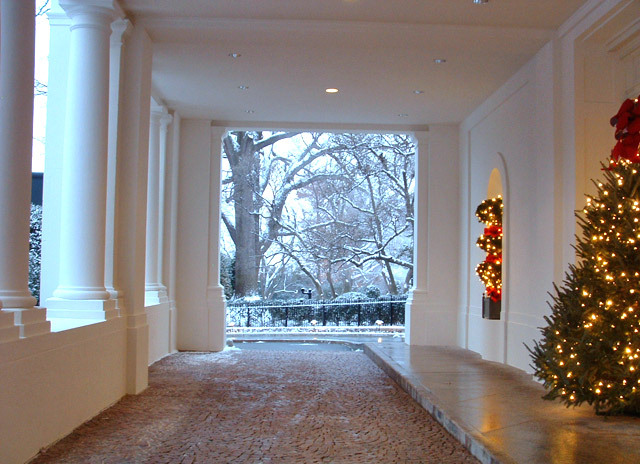 Please enjoy these beautiful photos of the White House at its best! 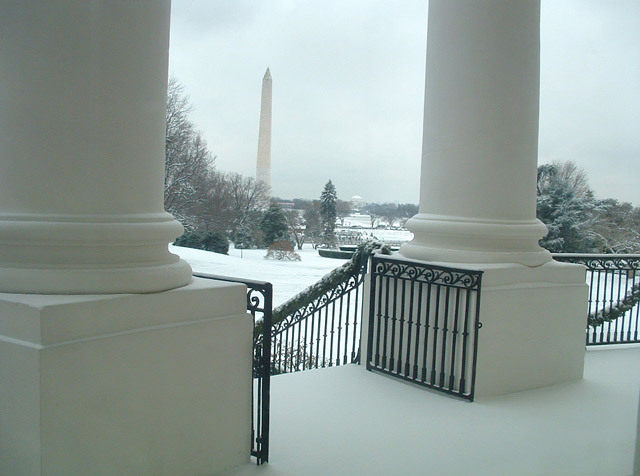 The view from outside the White House on a snowy day. 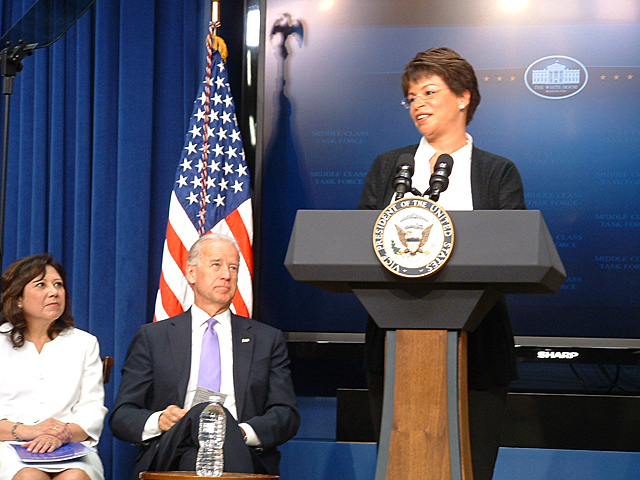 Janet Kopenhaver awaits her admittance into the White House party. 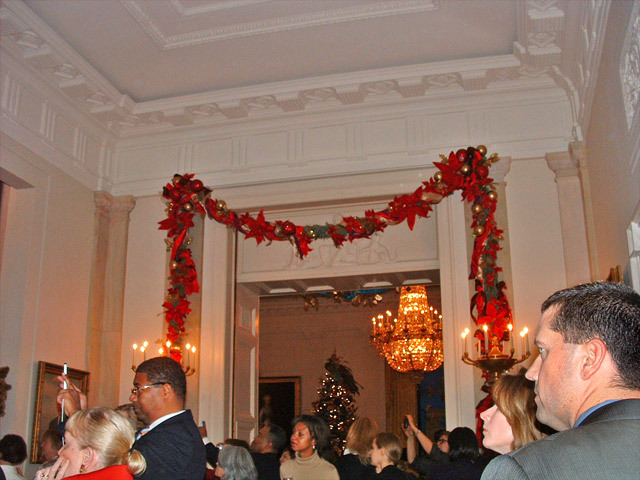 The entrance to the East Wing celebrates our nation's national treasures with a garland made of all nature's finest including oak leaves and pine cones. 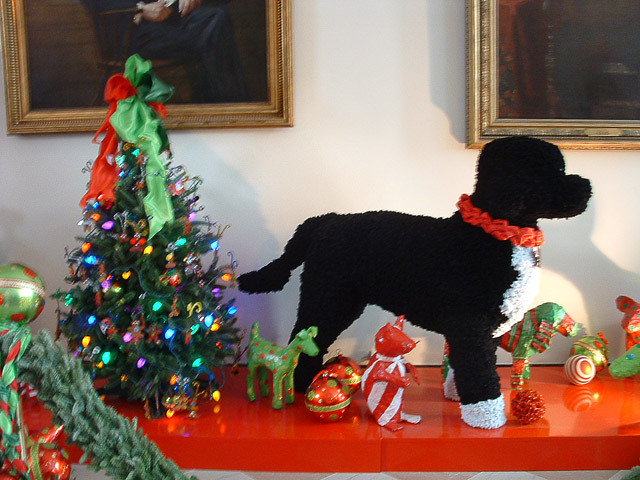 Upon entering the East Wing, visitors were greeted with a paper mache replica of "Bo" - the First Dog. 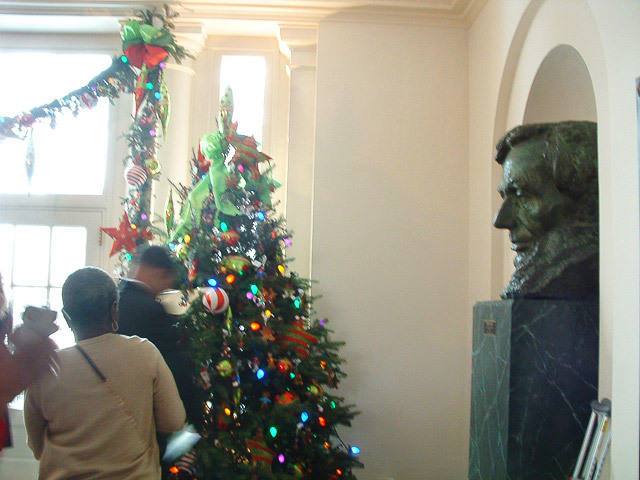 Guests were asked to send Best Wishes notes in the East Wing reception area while the bust of Abraham Lincoln looks on. 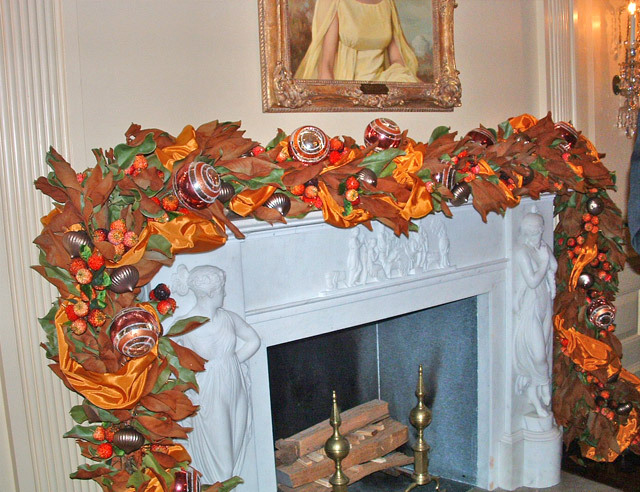 In the Vermeil Room, peach, gold and amber colors highlight our nation's music with mantel and table decorations of musically themed ornaments. 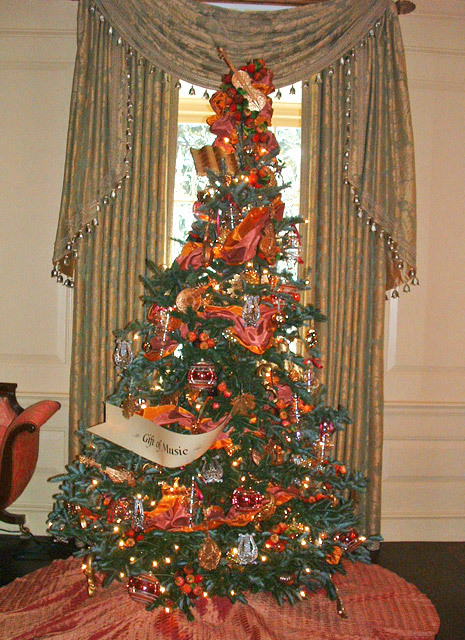 The tree in the Vermeil Room celebrating music. 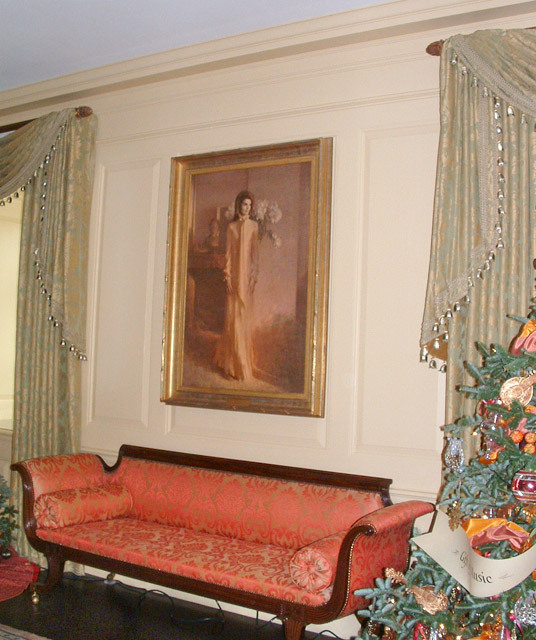 The famous portrait of John F. Kennedy by Aaron Shikler posthumously adorns the wall in the East Room. 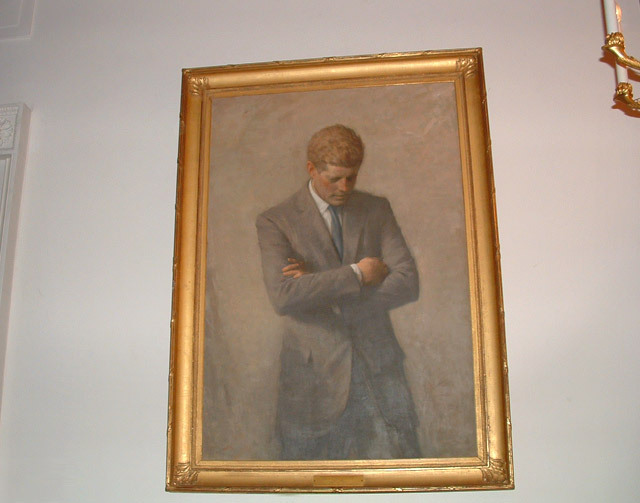 It has been said that Shikler wished not to paint the eyes of a dead man, thus the portrait features JFK with his eyes downcast. 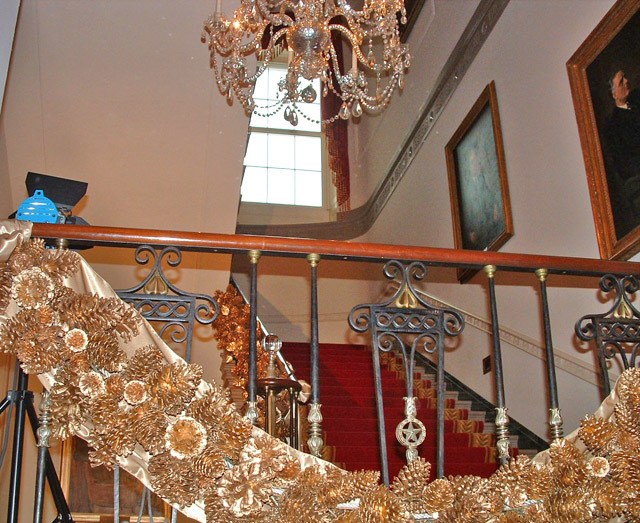 Jackie Kennedy's portrait adorns the First Ladies' Room. 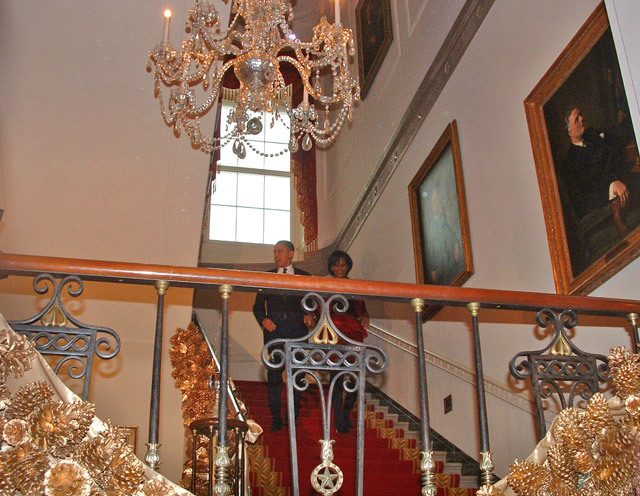 Waiting for the President and the First Lady to descend the stairs from their residence. President Obama and First Lady Michelle Obama appear and wish Happy Holidays to the crowd. The view from outside the Red Room on this majestic snowy night. 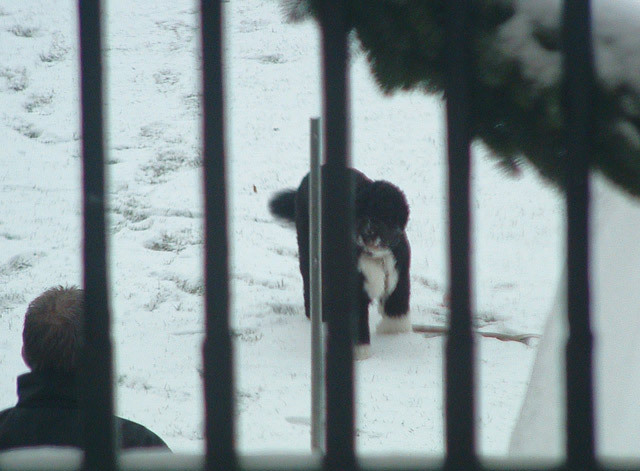 Not only did the Holiday Party guests enjoy the snowstorm, but "Bo" the First Dog was enjoying a snowball fight with his handler. 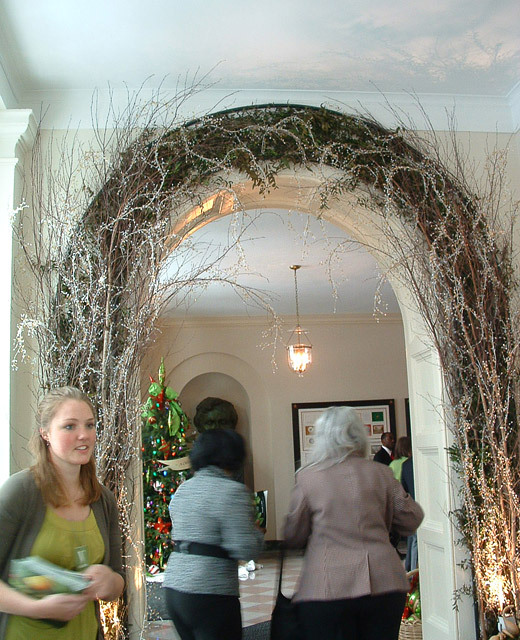 The entrance to the White House residence decorated for the season. 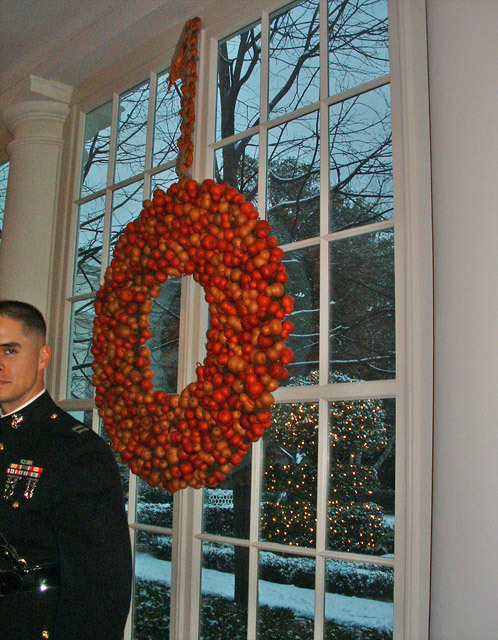 Cranberry and pine cone wreaths adorn the hallway leading out of the White House. 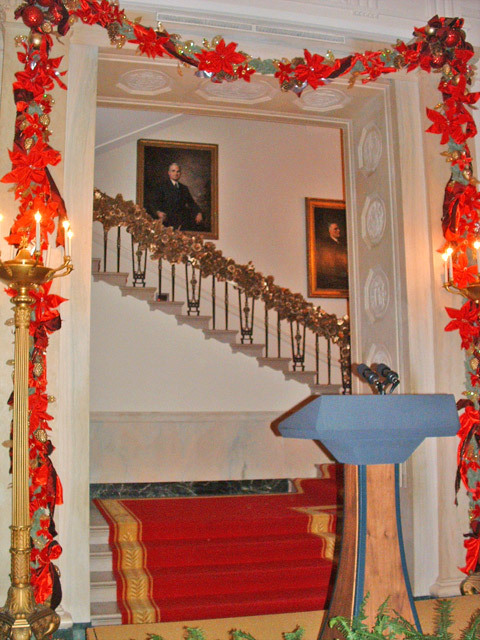 The cranberry garland awaits visitors to the Red Room. 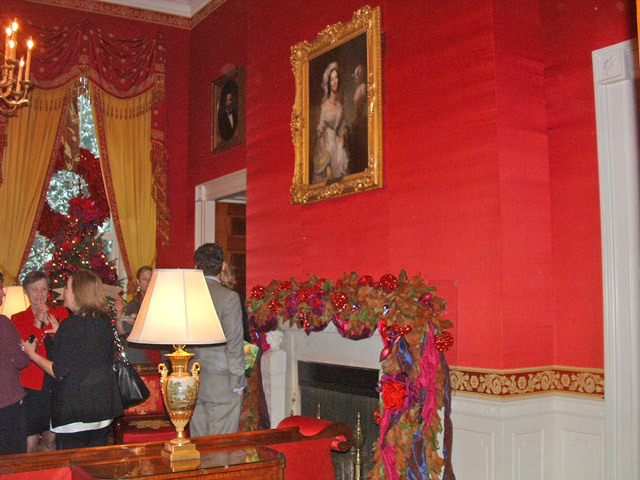 The beautiful Red Room, complete with cranberry tree and scarlet lacquered magnolia wreaths in each of the windows. 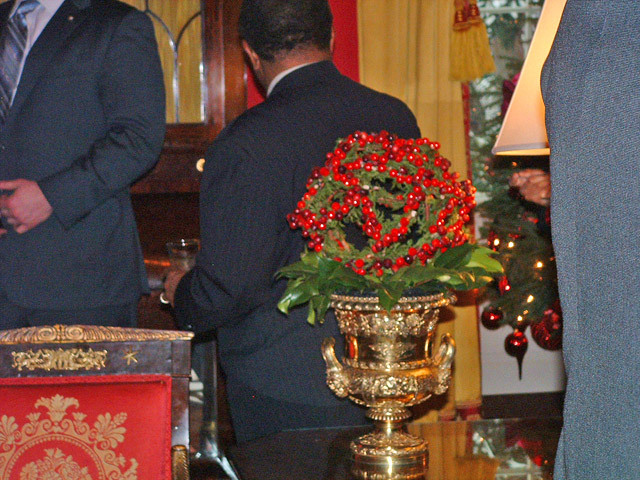 Topiary spheres of branches and cranberries are a highlight of the Red Room. 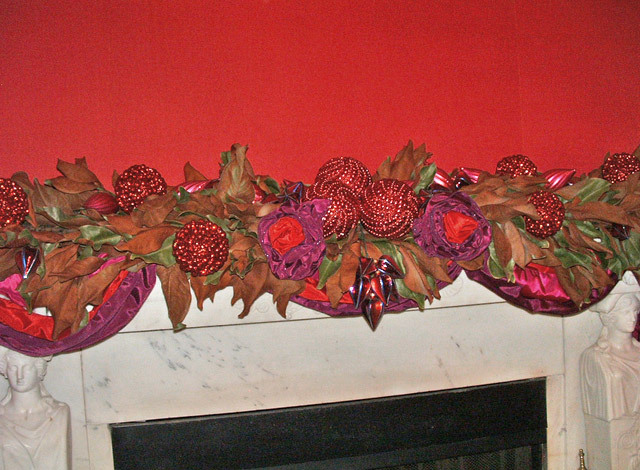 The mantles in the Red Room are simply gorgeous! 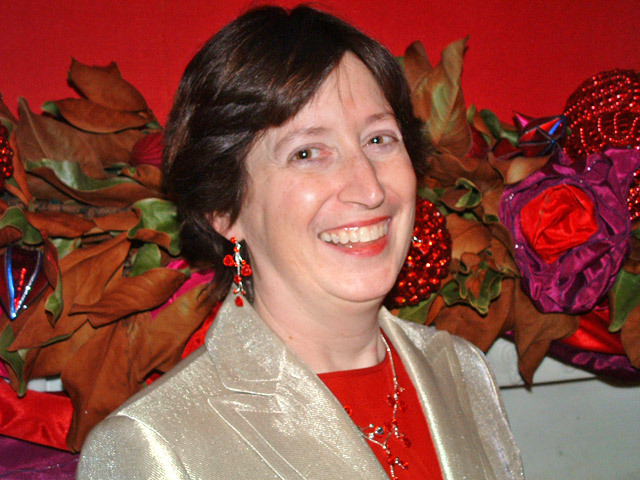 Janet Kopenhaver enjoys the Red Room - her favorite! 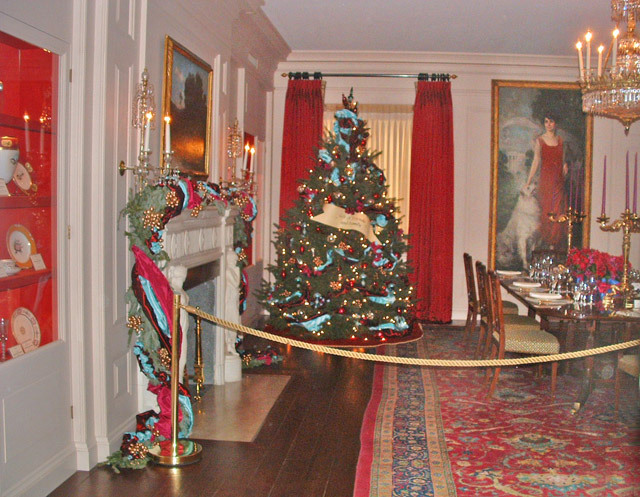 The China Room displays a table set with the Reagan and Clinton china. This is to represent the excitement of bringing family and friends together for a holiday meal. 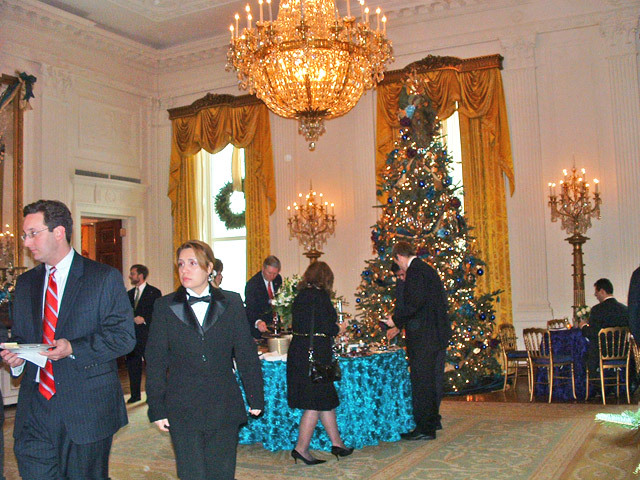 The State Dining Room is filled with delicious food, drink and desserts for visitors to enjoy. 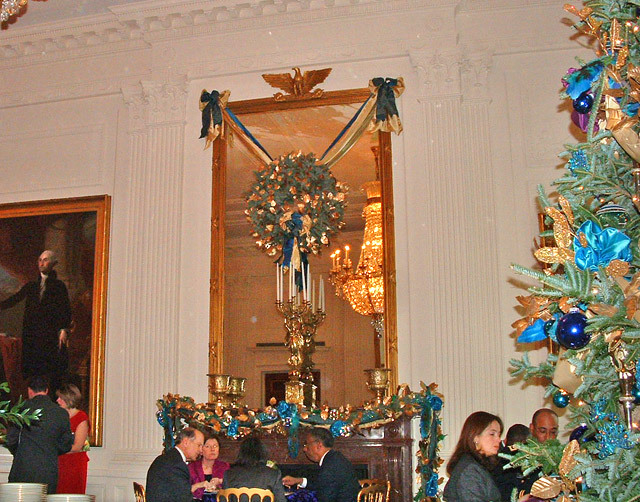 Even the mirrors are decorated in the State Dining Room. 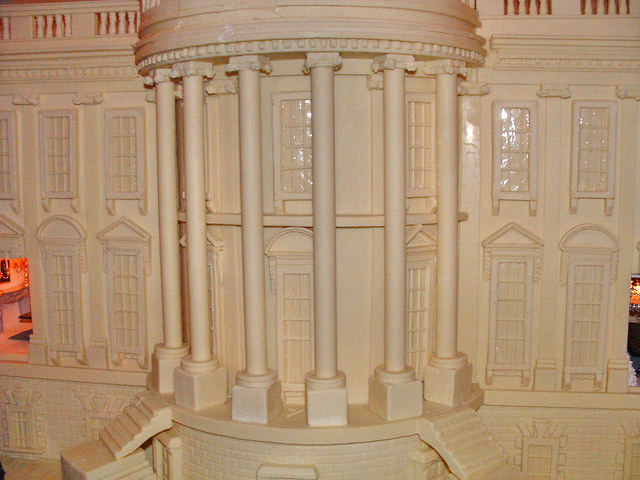 A close up marzipan White House. 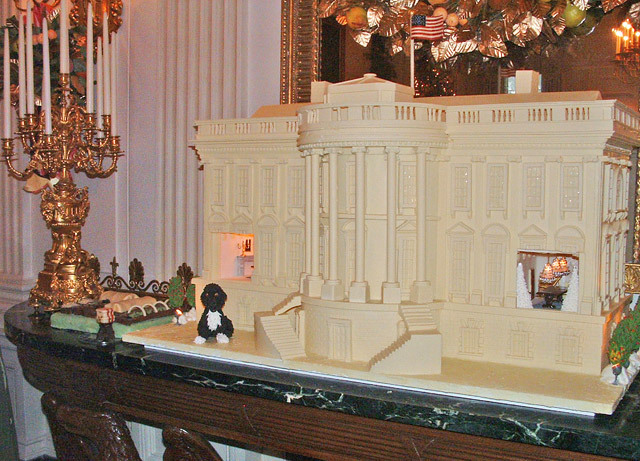 A marzipan replica of the White House, complete with "Bo" and the First Lady's vegetable garden. 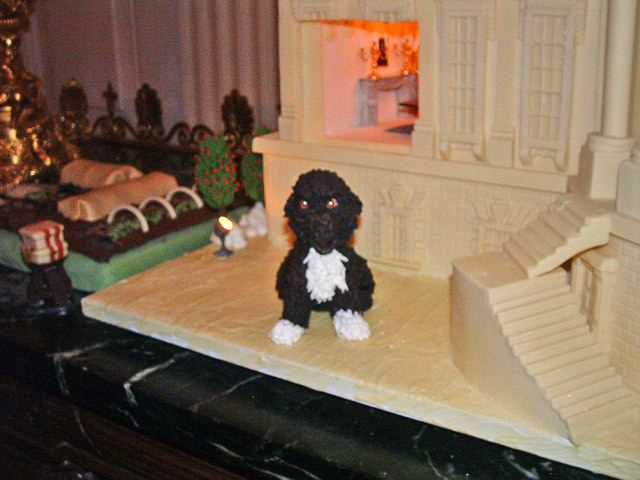 A close up of the marzipan "Bo". 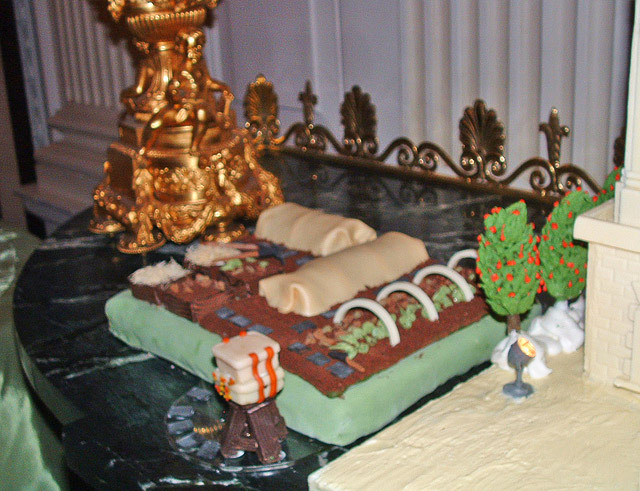 A close up shot of the marzipan White House vegetable garden. 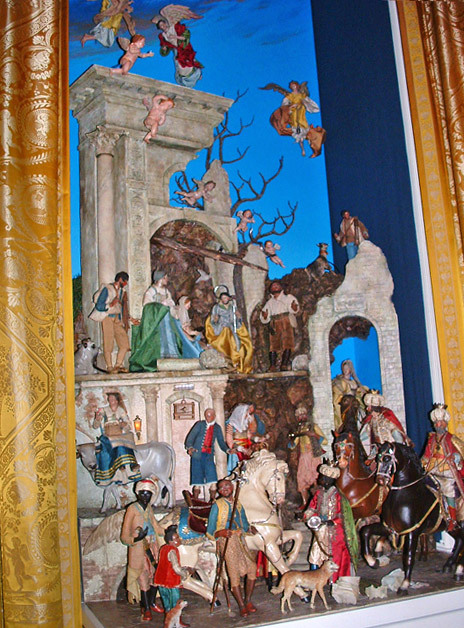 An intricate wall sculpture in the State Dining Room. 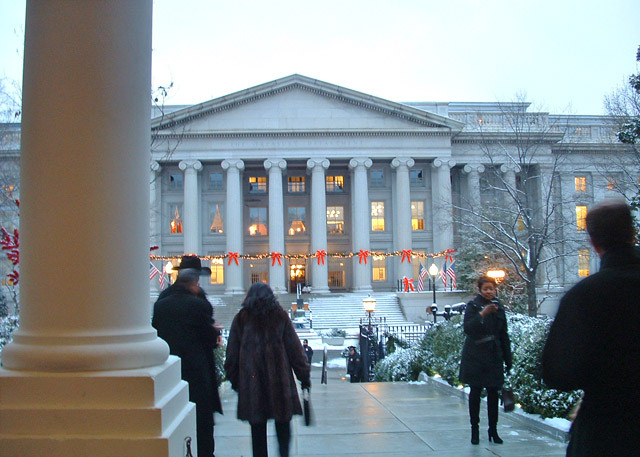 Leaving the White House on this wintry holiday night. 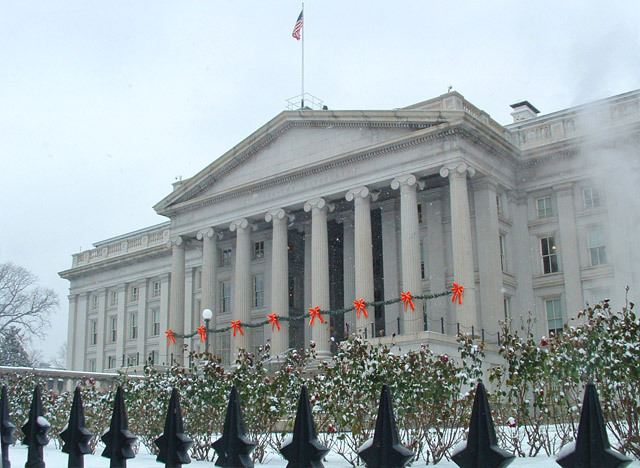 Enjoying the sights of the White House from the outside. 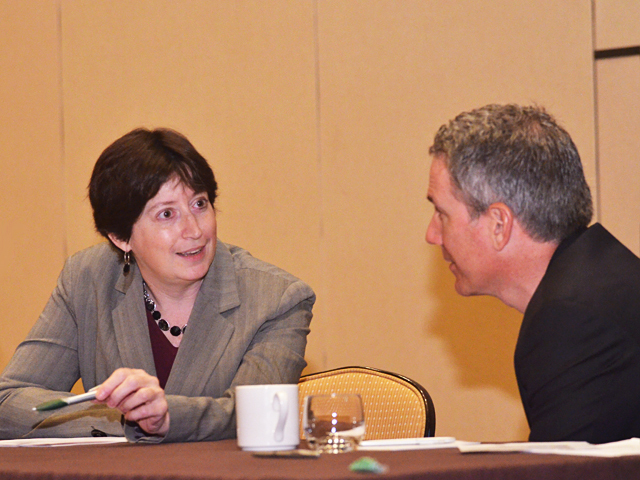 Janet talks to the AWPA Vice President before her presentation. 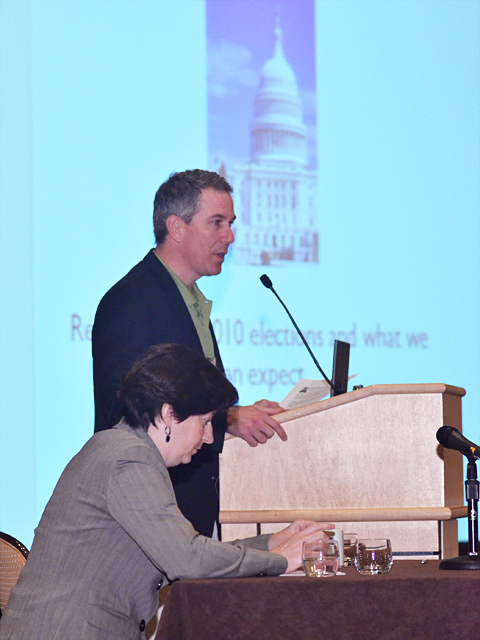 AWPA's Vice President introduces Janet to the audience. 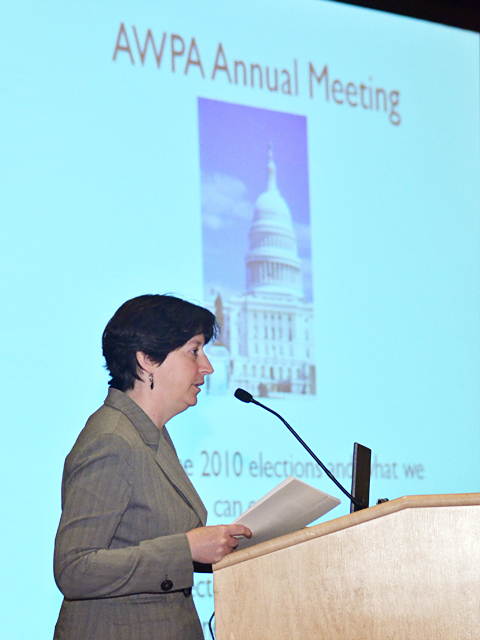 Janet Kopenhaver, in her capacity as the Director of Government Relations for the American Wire Producers association (AWPA), briefs the audience on the results of the November 2010 elections, the changes in Congress, and what this means for their industry. 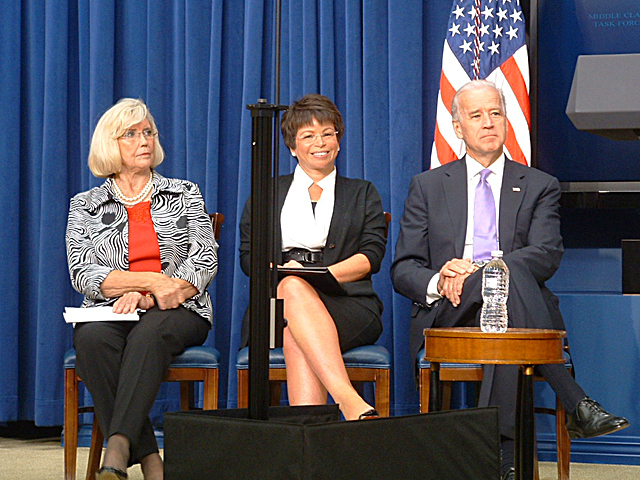 Eye on Washington�s President Janet Kopenhaver was invited to attend and participate in Vice President Joe Biden's Middle Class Task Force event centering on solutions for families balancing the dual demands of work and caring for family, and expressing support for the Paycheck Fairness Act. 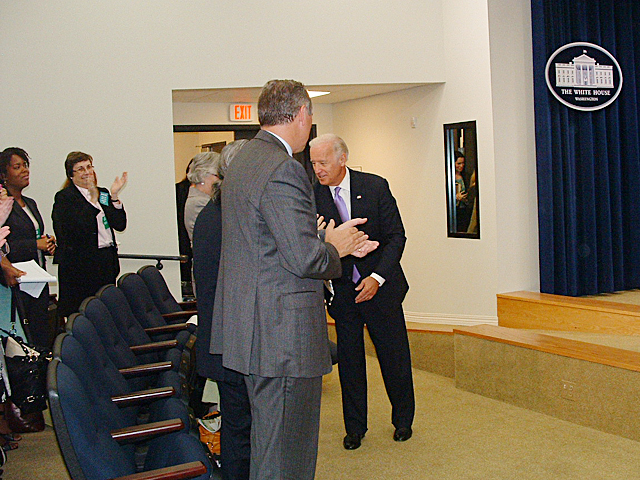 Vice President Joe Biden enters the Old Executive Office Building to start the Middle Class Task Force event on Work/Life Balance solutions. 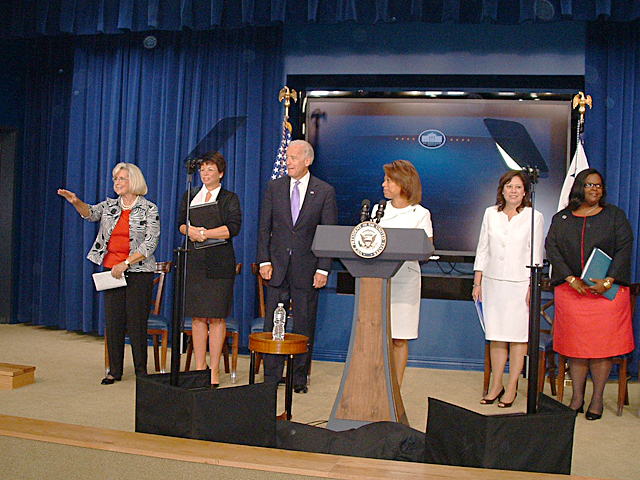 Participating in the conference were Lilly Ledbetter, the namesake of the Lily Ledbetter Fair Pay Act, Valerie Jarrett, Senior Advisor to the President, Vice President Joe Biden, White House Domestic Policy Council Director Melody Barnes, Secretary of Labor Hilda Solis and Chair of the Equal Employment Opportunity Commission Jacqueline Berrien. 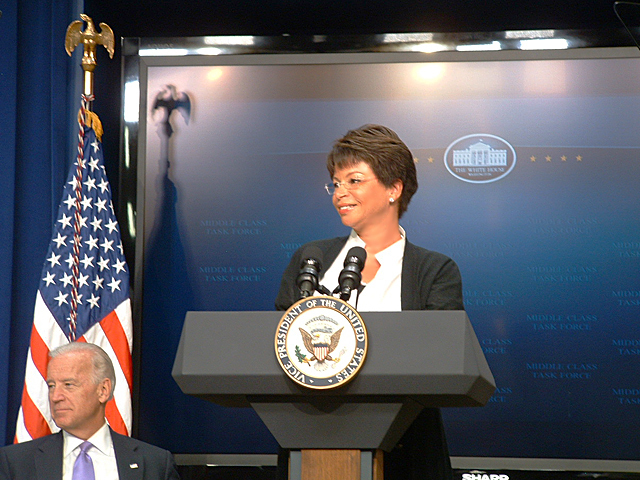 Valerie Jarrett, Senior Advisor to the President, assures audience that the President is dedicated to signing into law the Paycheck Fairness Act. 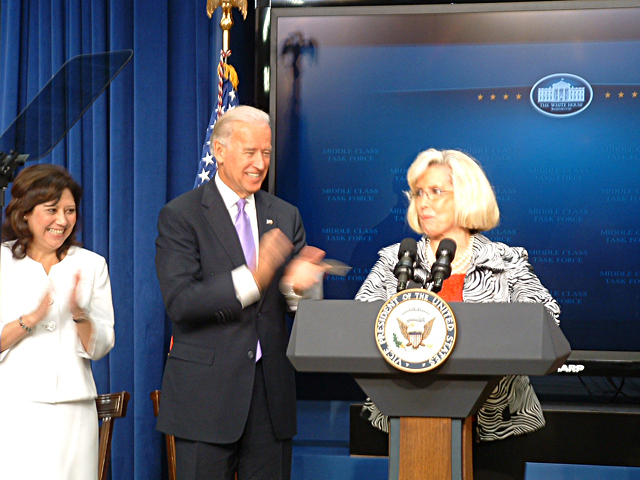 Lilly Ledbetter, the namesake for the Lilly Ledbetter Fair Pay Act, receives a standing ovation for her tireless efforts in achieving fair pay for women in our country. 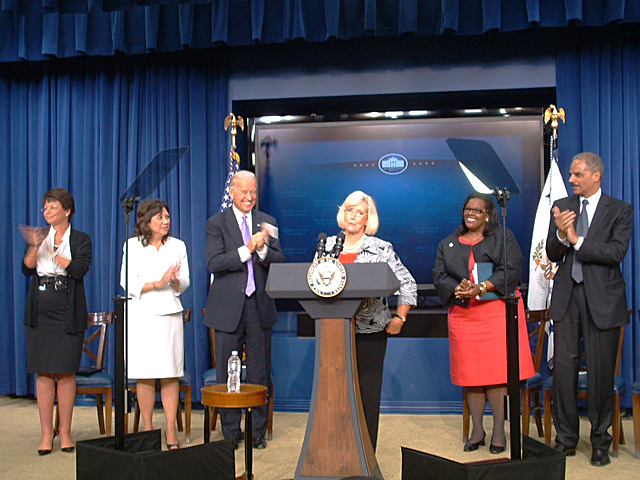 This legislation, the first to be signed by President Obama, provided means to fight pay discrimination and ensure fundamental fairness to American workers. 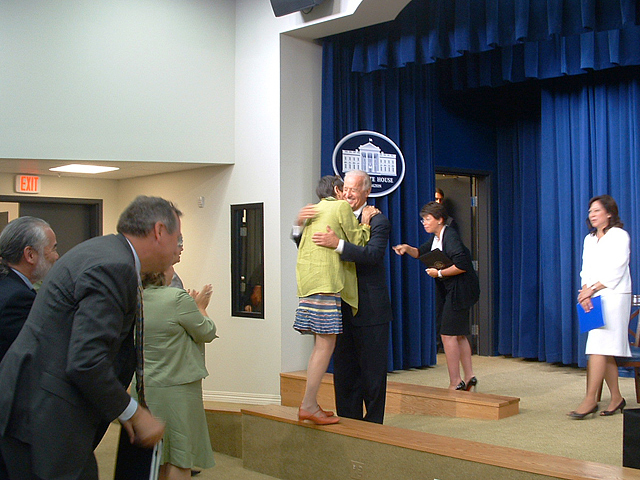 Ledbetter relates her emotional story and the pay discrimination against her simply because of her gender. Vice President Biden discusses the recommendations of the Middle Class Task Force, including the passage of the Paycheck Fairness Act. 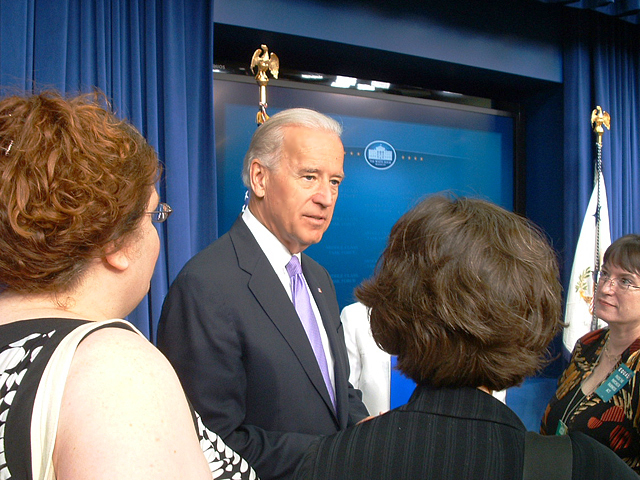 Vice President Biden greets Rep. Rosa DeLauro (D-3-CT), the sponsor of the Paycheck Fairness Act in the House and proactive advocate in the Congress for women's issues. 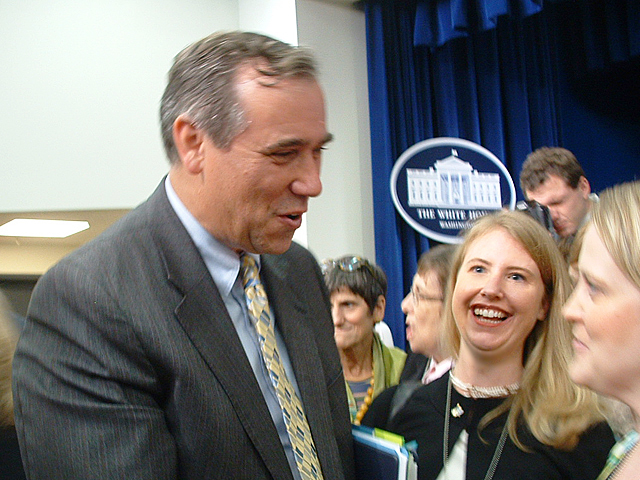 Sen. Jeff Merkley (D-OR), the sponsor of the Paycheck Fairness Act in the Senate, chats with attendees after the speakers finish. 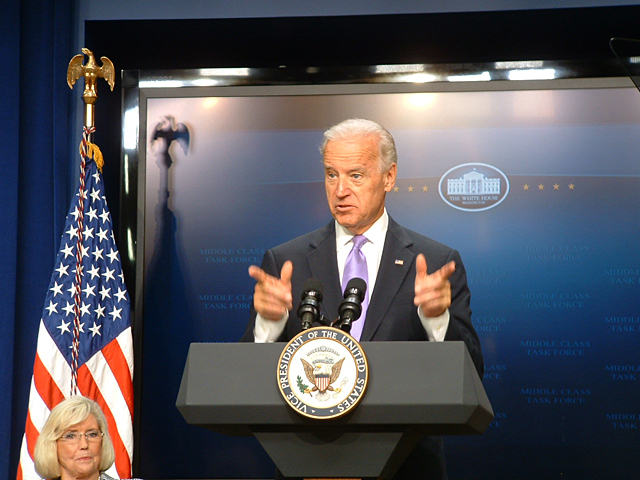 Vice President Biden mills with attendees after event and discusses the upcoming elections. 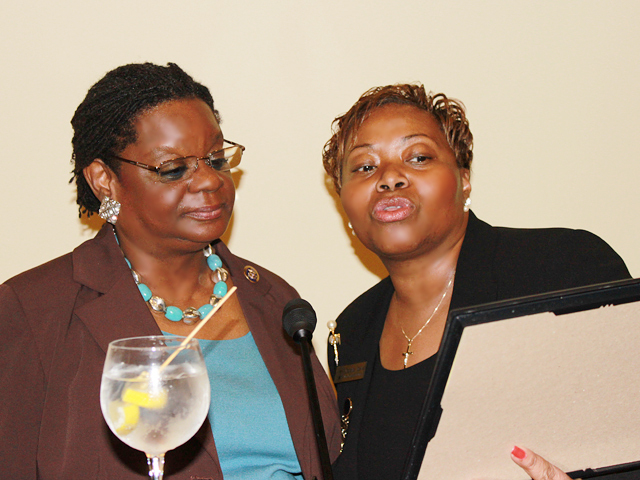 A client National Vice President for Congressional Relations Cecelia Davis reads Certificate of Appreciation language to Rep. Moore. 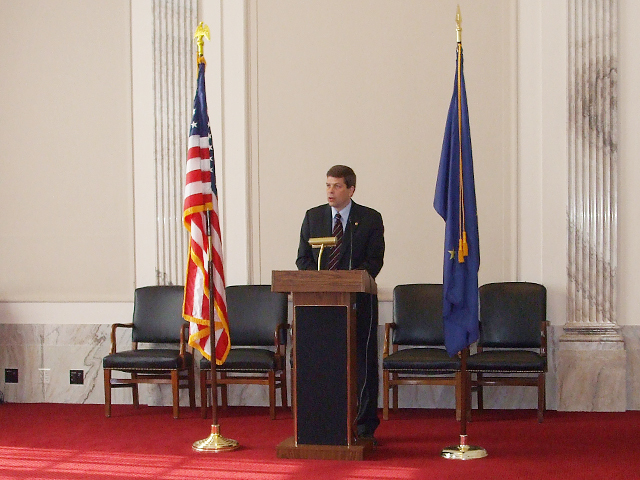 A client Alaska representatives attend a constituent coffee with Senator Mark Begich. 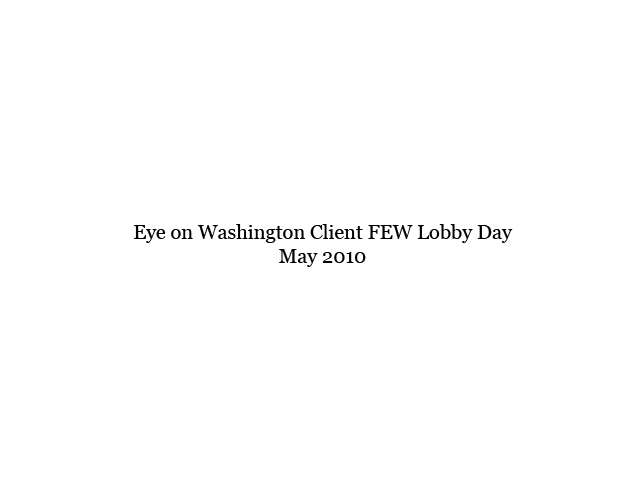 Within 24 hours after talking to the a client members, the Senator decided to co-sponsor a client priority legislative bill � the Paid Parental Leave Act (S 354). 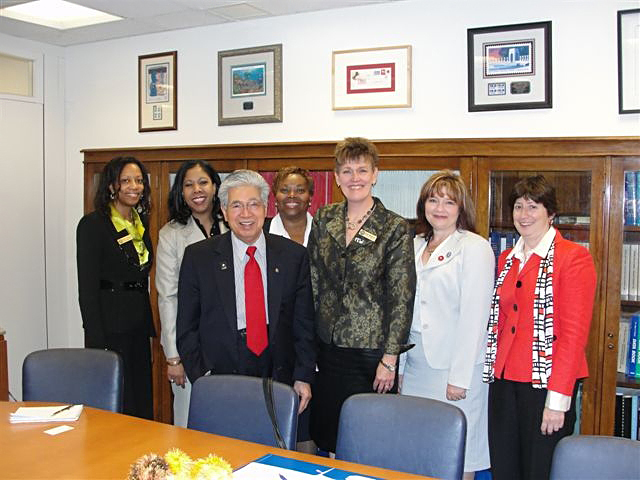 A former client leaders and Janet Kopenhaver (far right) meet with Senate Governmental Affairs Federal Workforce Subcommittee Chairman Daniel Akaka (D-HI) to discuss issues of importance to federal workers. 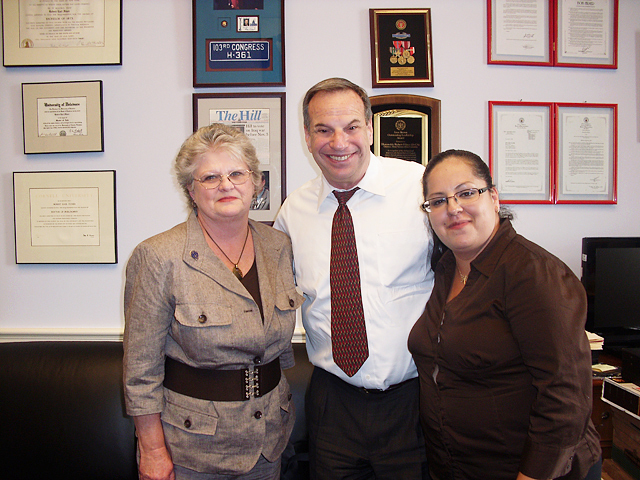 California a client members from San Diego and Lakeside met with Rep. Bob Filkner (D-51-CA). They thanked him for his support of all the a client legislative priority issues. 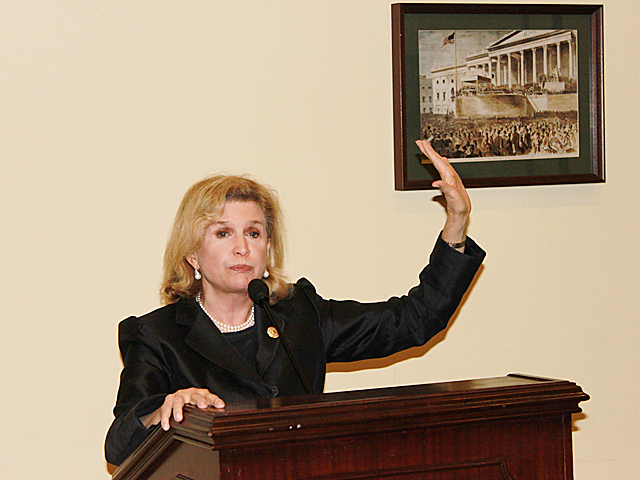 Rep. Carolyn Maloney (D-14-NY), a sponsor of several a client legislative priority bills, pumps up the crowd at the reception honoring the members of the Congressional Women's Caucus organized by Eye on Washington. 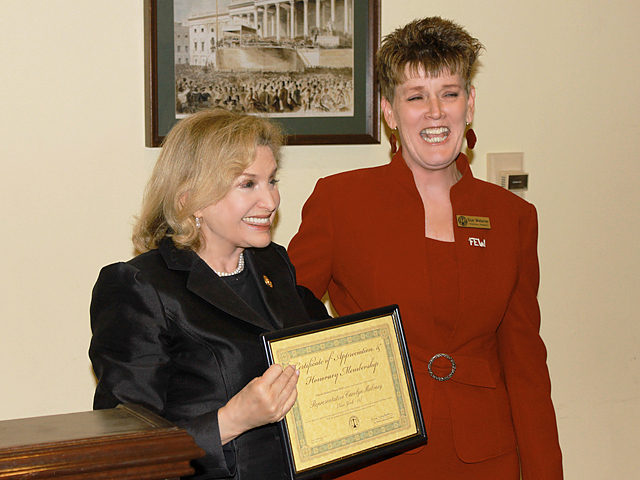 A client National President Sue Webster presents Rep. Maloney with a Certificate of Recognition in honor of her superb work on advancing women�s equality and rights in the Congress. 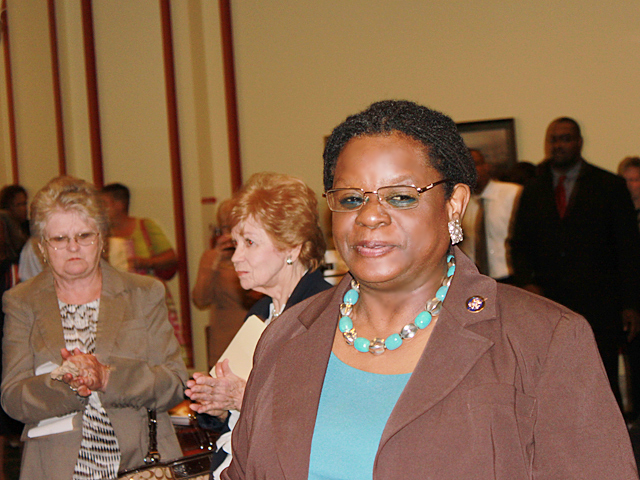 Congressional Women's Caucus Vice Chair Gwen Moore (D-4-WI) gets ready to address the crowd at Caucus reception. 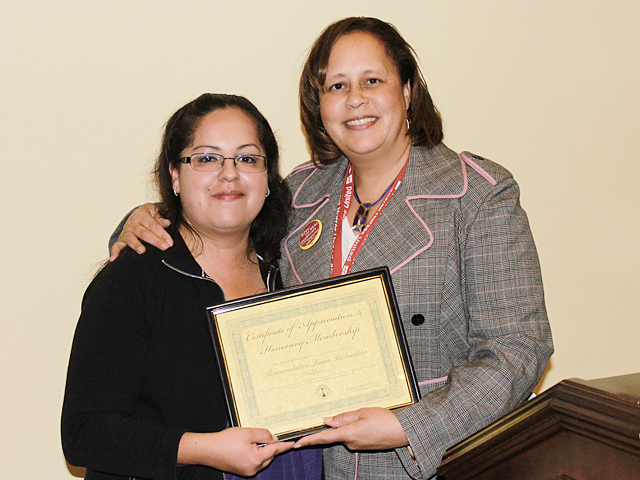 A client California member Melina Baray presents Rep. Richardson with a Certificate of Appreciation for her work on women's issues. 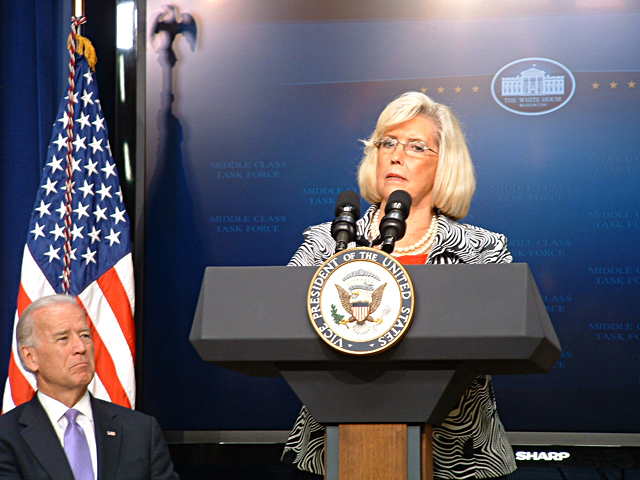 Eye on Washington's President Janet Kopenhaver briefs a client President and other leaders before their meeting with Sen. Daniel Akaka (D-HI). 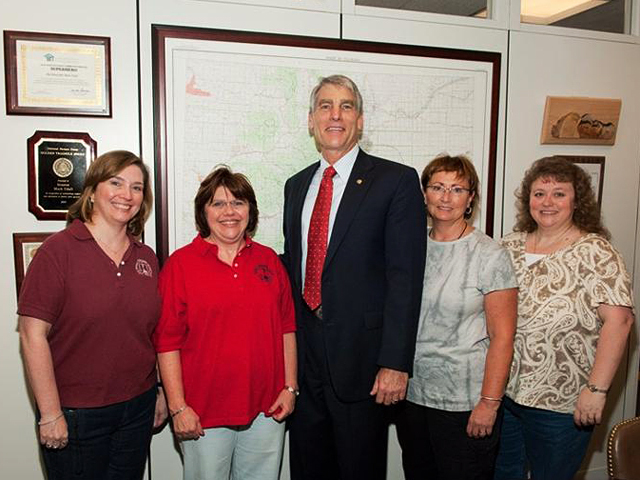 The Colorado delegation meets with Sen. Mark Udall to discuss federal worker issues.